Invoices will be sent on behalf of a legal person (university or company) without VAT (except Spain). If an invoice is requested by a natural person, the VAT should be added. (*) For Credit Card payment, a 2% (bank costs) will be applied. 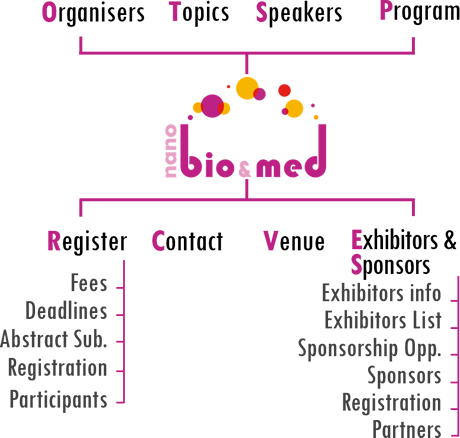 PLEASE, SEND BY email (info@nanobiomedconf.com) A COPY OF YOUR BANK TRANSFER MAKING CLEAR THE NAME OF PARTICIPANTS TO NanoBio&Med016 CONFERENCE. All cancellations should be made in writing by e-mail to Dr. Antonio Correia. The Organisation Committee will not be responsible for any medical expenses, lost property, or accidents during the NanoBio&Med2016 Conference and we strongly recommend that participants make all necessary insurance arrangements for themselves.